As someone following the UK EU referendum very closely it has been hard to explain to people less obsessed than I am about quite how strange the whole "debate" has become. Today's event in London perhaps helps put things into context. Buzzfeed summed up the absurdities for an American audience, but the lessons from their amusing piece could apply more or less anywhere. 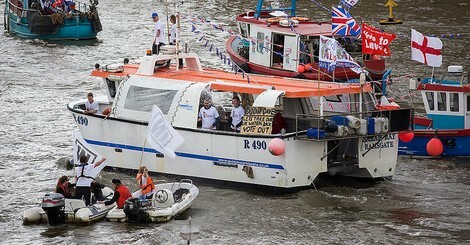 The Leave campaign assembled a flotilla of boats and sailed them from the Thames Estuary right up to the Houses of Parliament at Westminster. Despite the Leave campaign railing against corrupt elites, the lead boat had been involved in major fraud. Fishermen in one boat screamed that the EU was akin to Hitler. The maverick pop star Bob Geldof set sail in a rival Remain boat that had a huge sound system mounted on it. And meanwhile UKIP leader Farage called the scientific evidence on smoking into question. I often hear from German friends that they appreciate Britain's idiosyncrasies. But today's flotilla seems to have taken British politics, and the debate about the EU, into a whole other place, something beyond idiosyncrasy and into the realm of the absurd. This is no way to do politics about an issue so serious that the outcome will have major political and economic implications for the rest of the EU and well as for the UK itself. The more level headed commentator Alex Massie even felt compelled to pen a piece entitled "Has England gone mad?" for The Spectator, wondering about the depths to which the debate has sunk. If, as now seems probable, the UK does indeed vote for Brexit on Thursday next week, the reaction in the rest of the EU must not be to question the EU, but to question how a country long thought of as a bastion of pragmatism has somehow lost its senses. Today's flotilla was just a microcosm of this.